If you come to Malaga for your vacation and rent a car with us, you may want to visit the province of Cádiz less than 2 hours away and with many options for a pretty entertaining day. You get to Cadiz from Malaga in the direction to Gibraltar from where you can cross the Natural Park of the Acorns if you want to enjoy nature or you can continue along the coast to Medina-Sidonia and Tarifa. In the city of Cadiz is situated the kilometre 0 of the highway N-340 linking Cadiz with Malaga and Almeria in a beautiful drive along the Mediterranean coast. 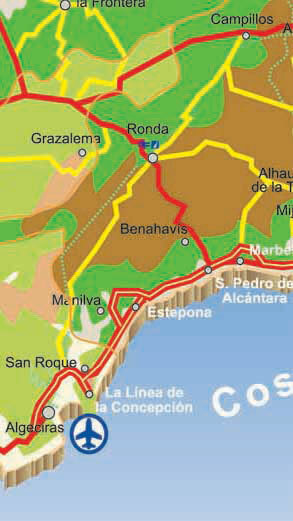 The highway A-48 connects the towns of San Fernando and Vejer de la Frontera, which coincides with the European route E-05 that runs through Chiclana, Conil, Vejer and Tarifa. In Algeciras the road A-381 connects Los Barrios to Jerez de la Frontera and continues to San Roque where it intersects with the CA-34 which connects La Linea to Gibraltar. 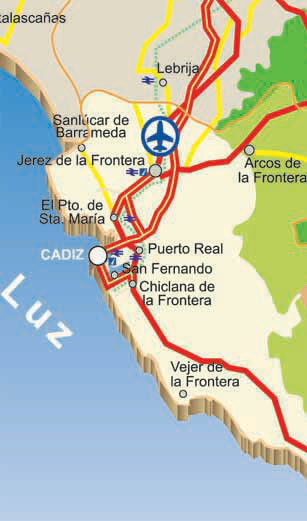 If you want to go to Zahara de los Atunes, the road connecting with this place is the A-2227.